The Ice Music Festival is a unique artistic and musical project arranged annually when the first full moon of the year occurs. It is an ovation to nature and to a resource treasured by mankind like no other: water. In its frozen state it is appreciated for a variety of purposes, from cooling drinks to posing as a temporary playground for more or less talented skaters. Here in Norway, it is even shaped by congenial creators into softly crackling, translucent musical instruments. Extravagant players elicit wondrous sounds in undependable, ever-changing acoustic colours coming from a harp, a cello, a tuba … some with clammy fingers wrapped in thick gloves protecting against the severe chill prevailing here. The festival site has recently been relocated from Geilo to Finse; the actual venue is located close to the Finse 1222 Hotel and the train station. Helpful to know that Finse is accessible solely by train during the winter months. Everything to do with this festival is exclusively fashioned from naturally harvested ice and snow. It unites artistic expressions from art, architecture, dance, photo, design, sculpting and music and is a singular meeting point for artists and audience alike to experiment, develop and to be inspired. With the majestic landscape forming an awesome backdrop, all festival premises are defined by nature, whereby the weather plays a decisive role: the quality of the ice depends on the winter conditions and the sounds of the instruments differ as temperature varies – making every concert a truly unique experience. With the moon determining the schedule and the weather deciding over the way the music sounds, the course of events is often unpredictable. 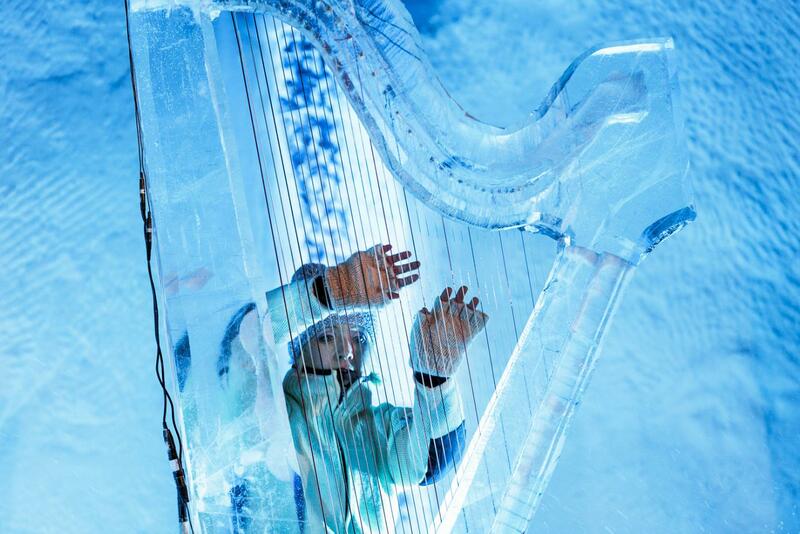 It had taken four people three days to construct this ice harp. Even though the Sidsel Walstad’s (above) performance had gone smoothly and the harp sounded just heavenly, she decided to further refine and tune her instrument the next morning. While away for a coffee break and during the regularly practiced exercise by the team of clearing snow off stage and instruments, the harp literally exploded into pieces. Fortunately no-one was injured and the reason for the mishap quickly analysed: an estimated pressure of 200 tonnes on each string exerted too much tension on the ice harp’s fragile frame… and a simpler and smaller model was expertly built in time for the next performance to take place. 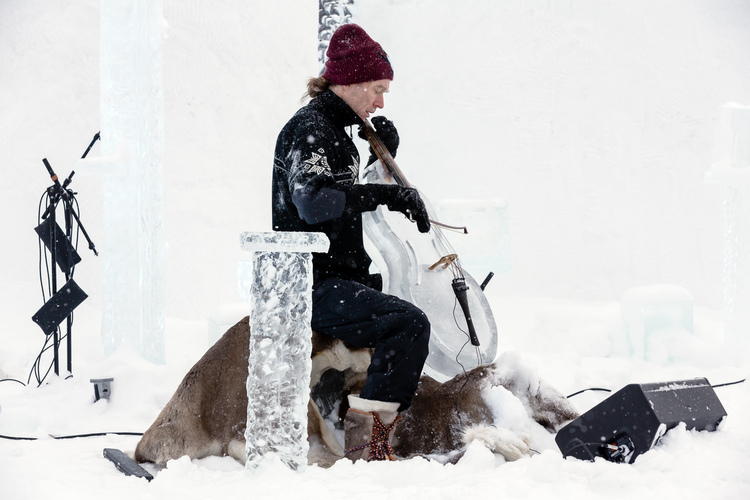 The Ice Music Festival 2019 takes place from the 14th to the 16th of February. No photo docs without him: Emile Holba. Emile Holba is a gifted professional photographer, who has been documenting the Ice Music Festival since its early years. 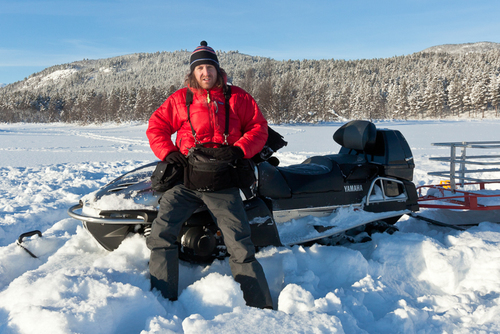 He has arranged and guided numerous TV, radio and news organisations around all working aspects of the Ice Music Festival – from hosting the broadcast team of ABC Good Morning America to the discreet recordings of BBC Radio 4, and competing France TV 2 and 3 film crews. Emile is creator/author of the Ice Music Festival site www.icemusicfestival.no Please visit to admire more of his sensational photos! Emile says of himself, that „he was mostly witnessed standing around with a tripod, wearing a ridiculous red jacket and pretending to do some work.“ Isn’t this a far too humble way of putting it?